I am so happy with my new jewelry. Your help in selecting just the right settings resulted in beautiful pieces that I am proud to own. 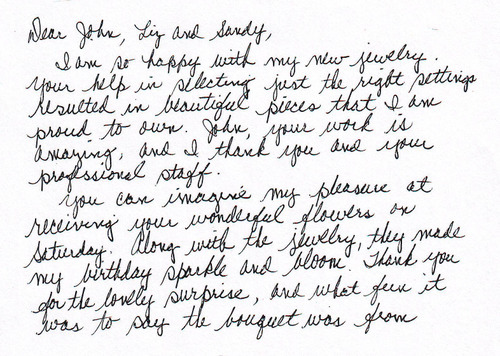 John, your work is amazing, and I thank you and your professional staff. You can imagine my pleasure at receiving your wonderful flowers on Saturday. Along with the jewelry, they made my birthday sparkle and bloom. Thank you for the lovely surprise, and what fun it was to say the bouquet was from you.